FINALLY! I am so excited to be able to post the items that I have been working on for what feels like forever. Yesterday was my sister’s bridal shower and I was responsible for making the centerpieces, the name tags for the favors and the card for the present from the bridal party. When we first started planning the shower, we were trying to think of a theme. My sister is a real girly girl and loves shoes, purses and dressing up. I came up with the theme “Sole Mates” and thought we could do a shoe-themed shower, since she LOVES shoes! 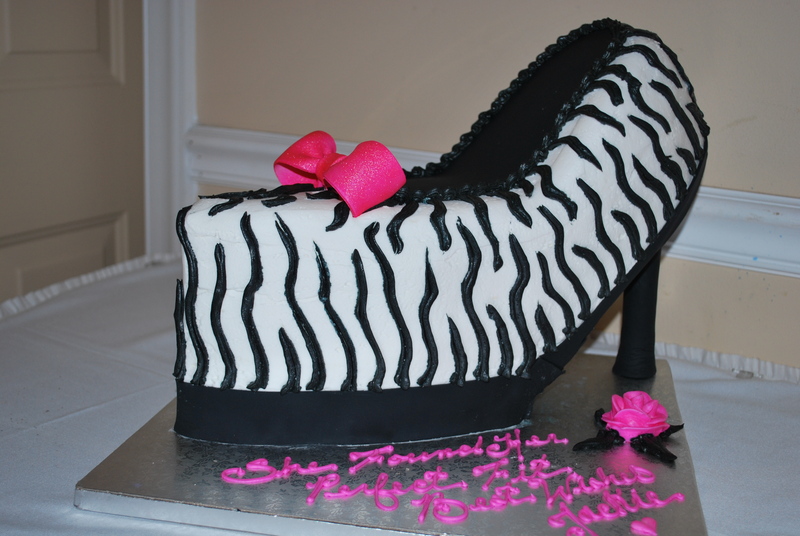 The idea for the theme got tweaked a little and evolved into a shoes and purses themed shower. 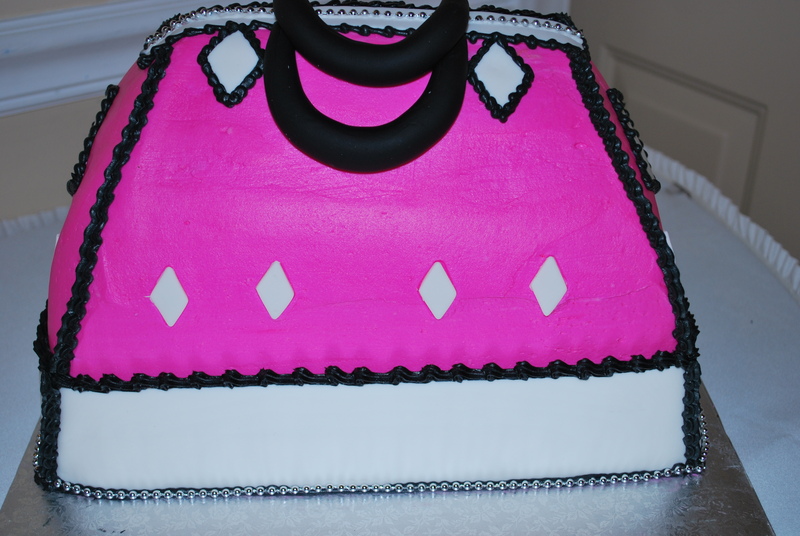 At one of the stores I work in, I found a purse shaped cake in the bakery. I thought those would make great centerpieces. 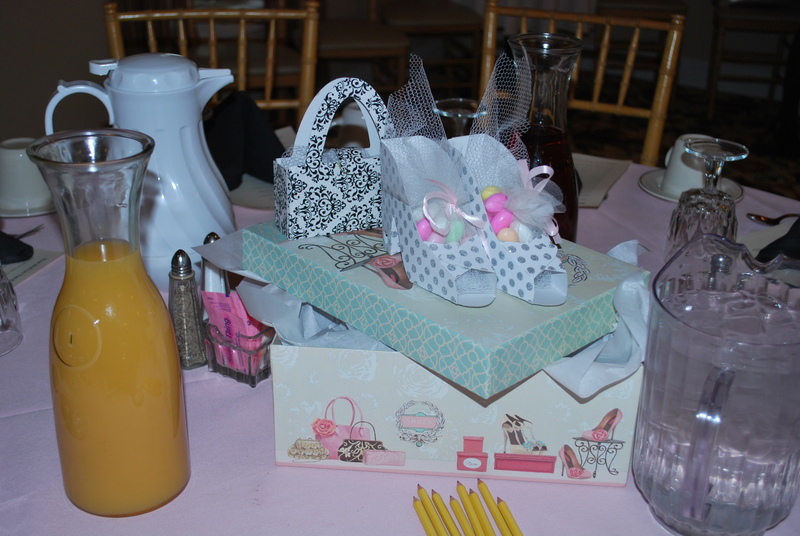 Another idea for the centerpieces would be to take photo/shoe boxes from AC Moore and make a pair of shoes and a purse to sit on top of the box. 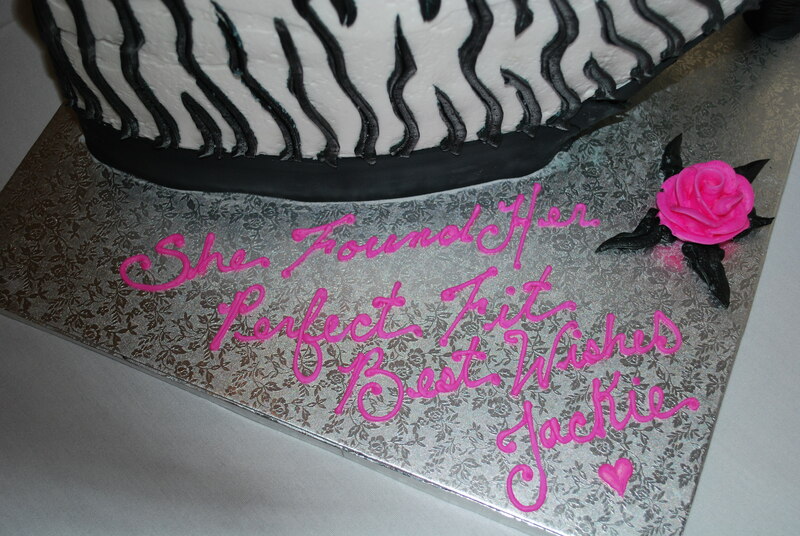 The girls in the bridal party took a vote and liked the boxes better than the cakes. Project number one on my list! 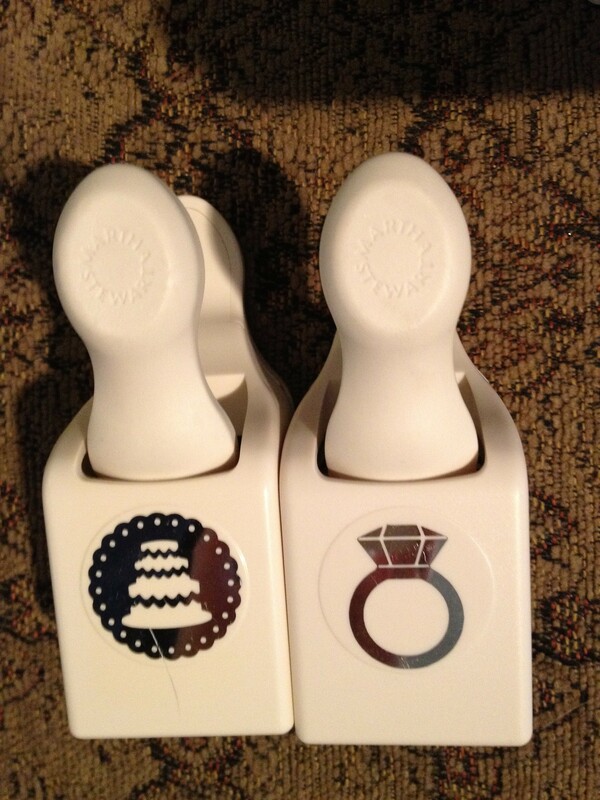 The second project I worked on for the shower was the favor tags. We threw around the idea of doing assigned seating and making the tables have designer shoe or purse names instead of numbers. In the end we decided not to do that, but instead just had everyone’s names on the handmade tags. Since the favors were pink and black purse shaped manicure sets, we couldn’t give them to the little girls. The two older ones got the same purses that were on the table filled with chapstick. The youngest is only one so we got her a box of animal crackers that she could carry around like a purse! The third project on my list was to make letters for the “What’s in Your Purse” game? We chose the word BRIDE and I made capitalized pink letters with a black shadow background that the MOH held up as she asked the guests to first look in their purses for something that begins with the letter “B”, then “R” and so forth. We did this about halfway through the bride opening her gifts to give her (and us) a break!! 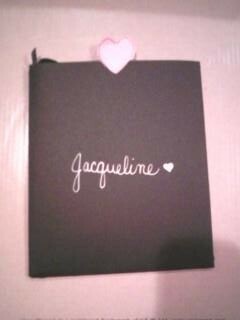 The last (and most important) project on my list was to make my sister a scrapbook. A couple of months ago, I asked the groom’s mother for some baby pictures of him. I went to my mom for pictures of my sister. Even though it was a lot of work, it was worth it to see her cry when she first looked at it! In keeping with the theme for the shower, for the bridal party’s card for Jackie I made a pink slider card (I cut the card out twice on the Cricut), punched ribbon holes along the sides of both cards, strung black ribbon through the holes and tied a bow at the top. 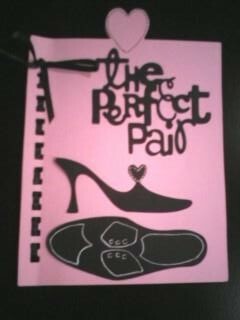 I then cut out the saying “The Perfect Pair” and the his and her shoes that coordinated in black. I traced the shoelace and parts of the shoe design in white gel pen and then adhered them to the front of the card. For the inside, I took a longer poem that I had found when I was working on things for their engagement dinner and wrote it in white on a black sheet of paper. I think that it looks like a chalkboard when you do that – personally, I really like the look! 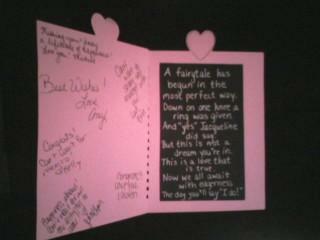 Once I was done with the bridal party’s card, I needed to make one for the scrapbook. 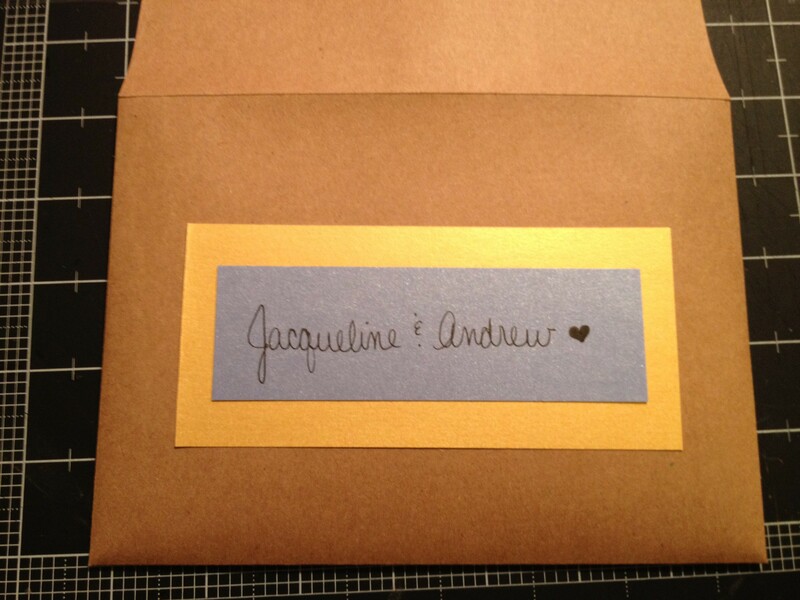 Jackie had her invitations designed by a friend I went to high school with and she very kindly asked me if I wanted to extra paper. 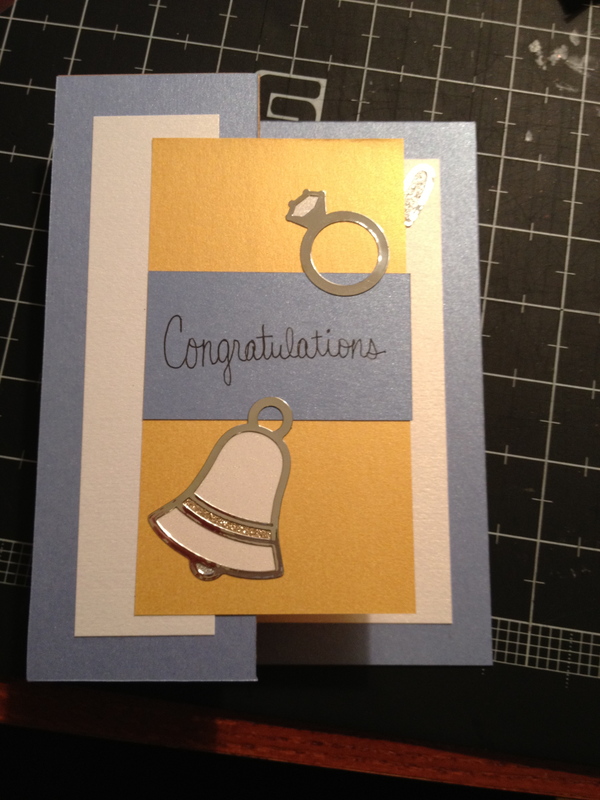 I used those pieces to create the background papers for her card so that her card reflected her wedding. (I was also able to use them on the last three pages of the scrapbook for his parents, our parents and eventually their own wedding photos!!) I added another handwritten poem I found online and finished the card off with some stickers. 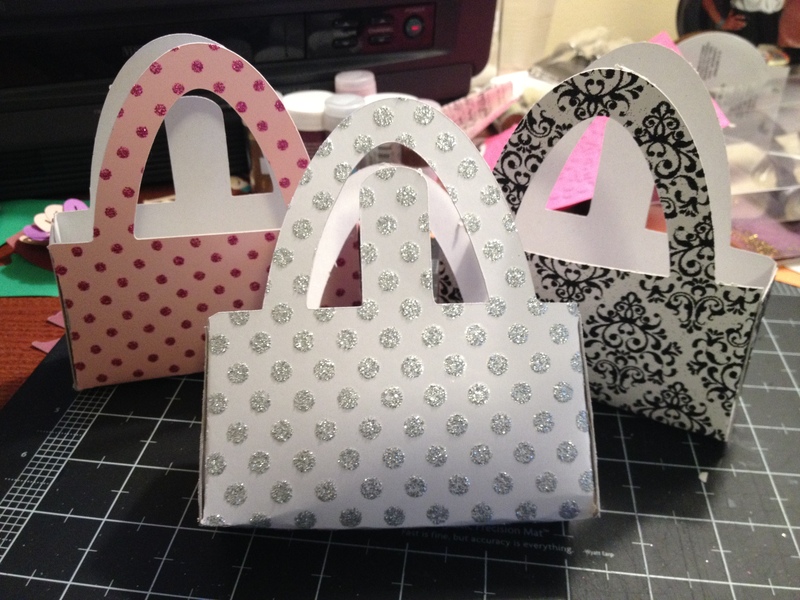 These are the purses that I made for the little girls. They’re similar to the ones that I made for the centerpieces. 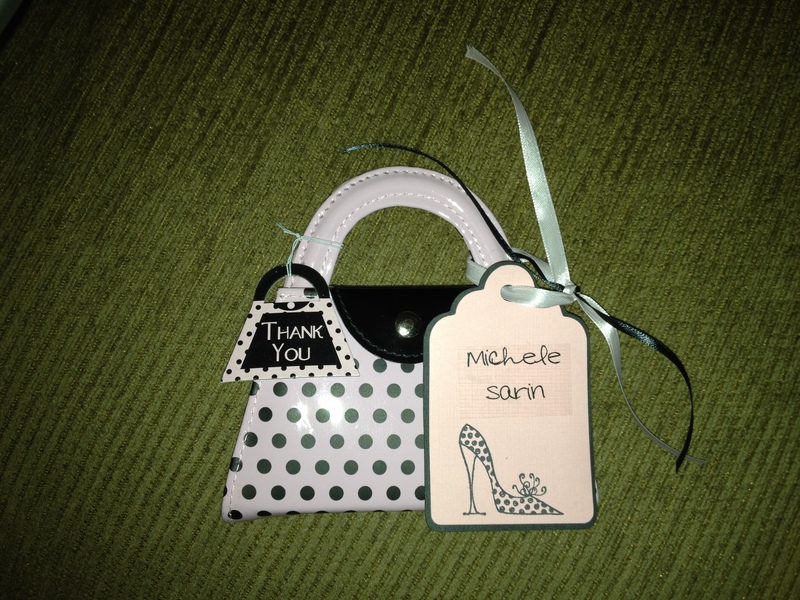 Here is the favor with the homemade tag, stamped with a shoe image and the guest’s name. 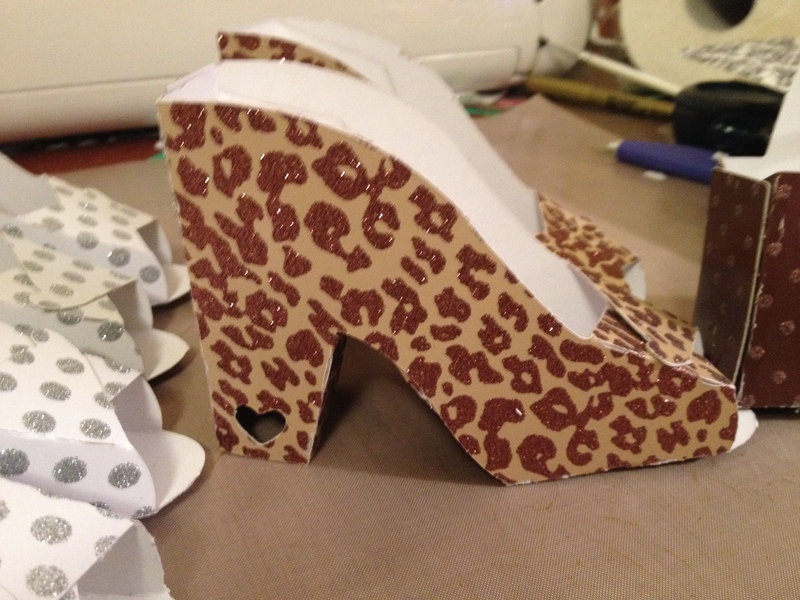 Example of the shoes that went on top of the photo/shoe boxes. 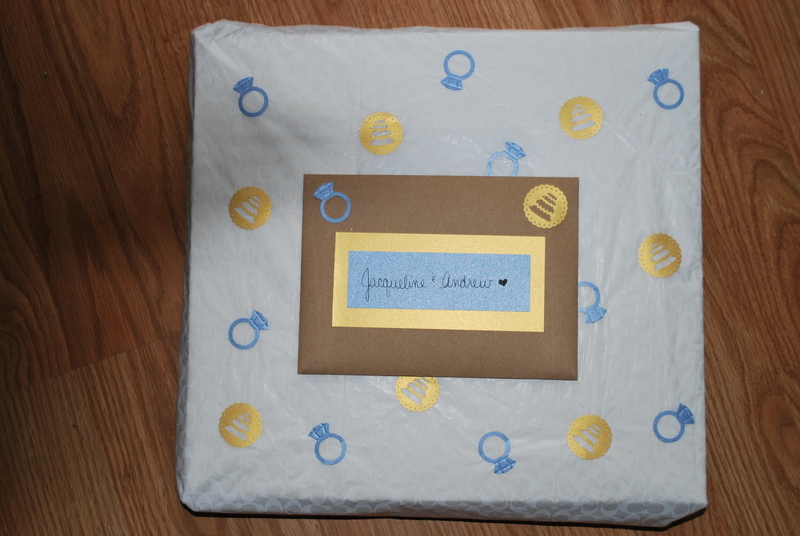 Her scrapbook – I will do another post with pictures from it and tell all about how I made it come together. 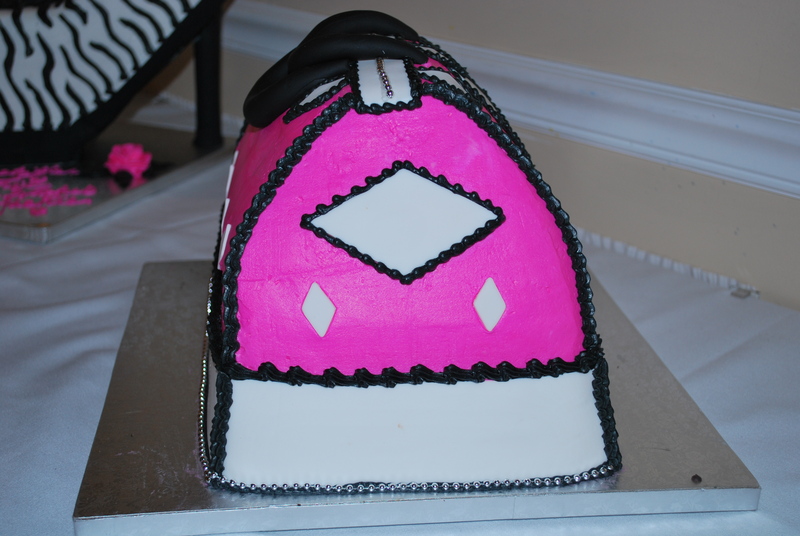 Hopefully this gives you some ideas if you are planning a bridal shower. 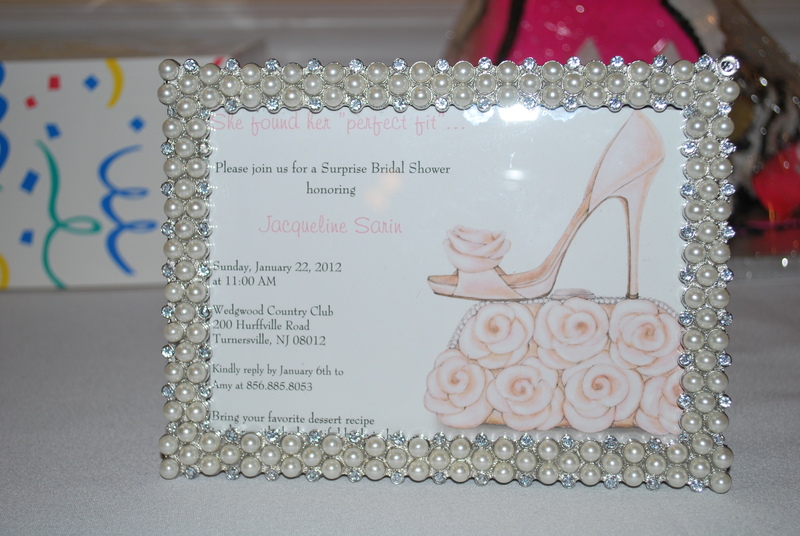 Posted in Homemade bridal shower ideas, ideas, scrapbook tips and tagged bridal shower, favors, homemade, purse shaped cake, shoe boxes, shoe themes, sole mates. Bookmark the permalink.